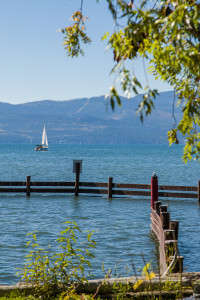 A Just 20 miles south of Glacier Park International Airport, a stone’s throw from Bigfork, and 30 miles from Glacier National Park, Flathead Lake is a national treasure of serene blue water and serpentine shores. Its glittering glacier-carved waters are among the largest, cleanest and clearest of North America’s lakes. The 160 miles of shoreline presents a vast playground for exceptional fishing, boating and all manner of water pursuits. In the heart of the Rocky Mountains, south of the Canadian border and west of the Continental Divide, northwest Montana has been called America’s largest outdoor destination with more than 6 million acres of public lands and more than 1,000 crystal clear lakes and streams, and is one of America’s most preserved mountain ecosystems in the world. Famous amongst its vastness are three wilderness areas: Bob Marshall Wilderness, Scapegoat Wilderness and the Great Bear Wilderness. These densely forested wilderness areas are homes to a multitude of wildlife and birds and ruggedly laced with mountains ranging from 4,000 feet to over 9,000 feet. Flathead Valley, referred to as “the Flathead” encompasses most of the northern part of Flathead Lake, the largest natural freshwater lake west of the Mississippi. Major cities and towns are Kalispell, the commercial hub of the valley; Whitefish to the north which is a resort town featuring the Whitefish Mountain Ski Resort; Columbia Falls to the east which is referred to as the Gateway to Glacier National Park; Bigfork which is a semi-resort town bordering Flathead Lake and River; and Lakeside/Somers which is along the northwest shore of Flathead Lake. The Glacier International Airport (FCA) is in Kalispell and is served by Delta, United, Alaska, and Allegiant airlines. And, yes, Shoppers, Kalispell has all the major box stores! 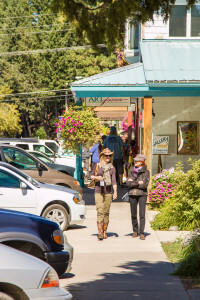 A few minutes’ walk from Bear Dance, Bigfork is the epitome of small-town spirit and the artistic heart of the Flathead Valley. Art galleries, boutiques, saloons and outdoor outfitters line its traditional main street. Chef-owned gourmet restaurants have earned the village a national reputation as a major epicurean destination. The 27 holes of championship golf at nearby Eagle Bend Golf Club was ranked among Montana’s best by Golf Digest for six consecutive years. For our fitness buffs, the Montana Athletic Club offers 22,000sf of state of the art athletic fitness equipment, a heated swimming pool, three tennis courts along with basketball, squash and racquetball courts, and a heated yoga/Pilates room. Every season at Bigfork brings a full calendar for enticing events, including the Glacier Symphony Summer Pops concert, a “Norman Rockwell-ian” old fashioned Fourth of July celebration that brings thousands to the Village, holiday revelry with the Bigfork Elves, the Bigfork Festival of the Arts, and the Bigfork Summer Playhouse – one of the finest live professional repertory theaters in the Northwest. Read about “The Village by the Bay” featured on the Flathead Beacon, written by Joyce Mitchell.